One of the most common factors contributing to the development of herbicide-resistant weeds is incorrect application timing. Therefore, applying both pre- and post-emergence herbicides at the right time is a simple step you can take to give yourself a leg up against tough-to-control weeds. It’s important with pre-emergence herbicide applications to spray as close to planting as possible. This will help you get the most out of your pre-emergence herbicide and attain the longest residual activity. It’s also important to use a herbicide that is flexible enough to work within your schedule. Choose a herbicide that will maintain its effectiveness, regardless of whether applications have to be moved up before planting, or delayed until after. For post-emergence applications, it’s crucial to consider weed height. Weeds should be sprayed based on the height recommended on your herbicide’s label. For most weeds, that’s a maximum of 4”. Keep in mind, the label recommendation is for the tallest weeds in the field. If applications are delayed until all weeds reach an average height of 4”, it is essentially the same as using a reduced rate application. This can actually lead to weeds developing resistance. 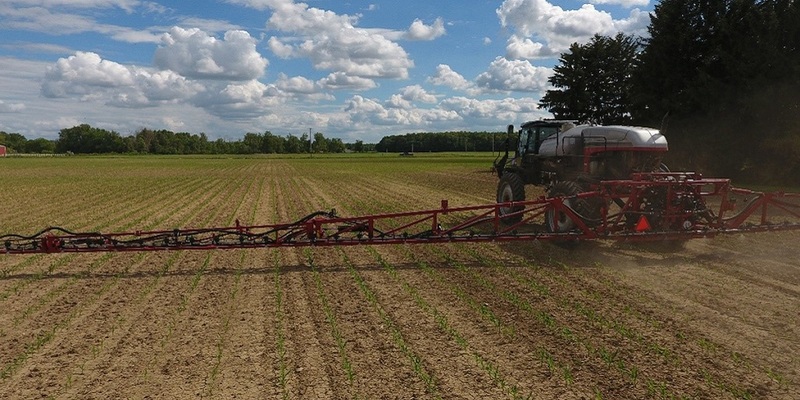 Plan a time for a post-emergence application with an overlapping residual, usually 3 to 4 weeks after the pre-emergence application, regardless of weed presence in the field. Don’t wait until you see weeds in the field, because oftentimes, that’s already too late. It’s also helpful to follow weather forecasts closely and plan ahead for conditions that could delay timely herbicide applications. Being proactive in planning post-emergence applications can help get around those curveballs. The global Herbicide Resistance Action Committee agrees. In its best management practices guide, it says the more weeds present in the field when the herbicide is applied, the higher the chance for resistance to develop. We recommend using a 2-pass system of overlapping residual products with multiple effective sites of action (SOAs). In corn, we recommend Acuron® or Acuron Flexi corn herbicides. Acuron has 4 active ingredients and 3 effective SOAs while Acuron Flexi, its atrazine-free counterpart, has 3 active ingredients and 2 effective SOAs. Both herbicides have wide application windows, ranging from 28 days pre-plant to 12” corn for Acuron, and up to 30” corn for Acuron Flexi. Both products contain the active ingredient bicyclopyrone, which complements the other active ingredients to deliver more effective and more consistent control than competitive products – especially on large-seeded broadleaf weeds. For optimal control, Acuron brands can be applied in a split-rate that should be followed post-emergence by either the remaining rate, or a full-rate followed post-emergence by Halex® GT herbicide and either an atrazine or dicamba product. Applying Halex GT post-emergence adds an additional SOA. For soybeans, we recommend a pre-emergence application of Boundary® 6.5 EC or BroadAxe® XC herbicides, both of which contain 2 effective SOAs. Those can be followed by Flexstar® GT 3.5 herbicide as a post-emergence application for 2 additional SOAs. Boundary can also be followed by Prefix® herbicide for management of ALS- and glyphosate-resistant weeds. Learn more about the best time to apply herbicides in this video. For more information on weed resistance management and local herbicide recommendations, visit ResistanceFighter.com. Sign up for the Know More, Grow More Digest to receive twice-monthly agronomic e-mail updates pertinent to your area.